Almostgolf Balls Are Perfectly Balanced for True Spin, Trajectory and Accuracy. 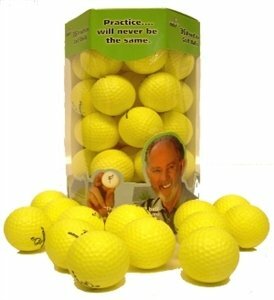 Includes 36 Yellow Practice Golf Balls and 5 Liberty Tees. The Internal Pressure of The Practice Golf Ball Results In A.32 Cor Rating. This Means It Travels Approximately One Third of a Traditional Golf Ball. Compresses Slightly Upon Impact Giving It a Real Pop of The Club Face Just Like a Real Golf Ball. Perfect Practice Golf BallsThe almostGOLF ball travels approximately one-third the distance of a normal golf ball so it's perfect for backyard practice. All club distances correlate to actual distance with a regulation ball. No longer do you have to soften your golf swing because the ball can't handle force, velocity or resistance HIT IT STRAIGHT, PLAY a FADE, or SHAPE a DRAW. The almostGOLF ball's true-flight characteristics allow you to accurately assess your golf swing and ball striking. No more second-guessing whether you're hitting the ball well because the almostGOLF ball responds just like the real thing. In simulator tests the almostGOLF ball has the same initial velocity, spin rate and launch angle of a traditional golf ball. It looses speed until it hits its apex, then it comes down softly and safely. COR RATING: The Coefficient of Restitution or Bounce affect the reaction off the club face and this is where CO2 pressure of the almostGOLF ball set it apart from all other practice balls. Traditional golf balls are made with compression molded superball rubber and a skin. As a result they bounce off the club face with amazing speed and velocity. to bring that same bounce without bringing the danger, we had to create bounce, without the weight. We accomplished this with thousands of bubbles that are pressurized inside the ball, so that when you strike the almostGOLF ball, the bubbles compress, then release, just like a superball, but without the distance and danger. Most importantly, unlike other practice balls, the COR rating allows realistic launch angle and spin off the club face to accurately diagnose swing flaws.. Imported from US.